Pros: VR is pretty good for a Google Cardboard headset, instructions are easy to walk through, material feels soft on the face. Cons: Expensive Google Cardboard headset, hard to get a device in and out of the foam material, limited to higher-end mobile phones. Cardboard headsets are step one in the VR experience: lower-end models that use a smart device, such as a mobile phone, to power the virtual reality content. Merge VR fits in this model: not made of cardboard necessarily, but primarily a viewer to hold the mobile phone — and so ideally the gadget should be comfortable. Merge sent us a review copy of its headset, and we played a number of games to give us the full experience. To start using the googles, download the Google Cardboard app. To pair the device — so it works with the mobile device of your choice — you capture the QR code on the back of the goggles with the camera app. Follow these instructions for an iPhone, and these for an Android device. The app does the heavy lifting on how to pair everything together. Adults may want to help children with this step. You pair the Merge VR goggles by pointing the camera at the QR code on the back of the headset. To start accessing content — the real fun—open www.merge.vr/MergeStart on a smart phone browser. (The site won't access on a laptop or desktop.) I initially tried to use an iPhone 5S: the screen is just too small. You really want an iPhone 6 at minimum to get the content to come through clearly. Downloading two games — InMind VR and Sisters — proved fun. The later was actually creepy. We did a full review on the site, but even seated on a couch, with people around whom I knew, I still felt I was pulled deeply enough in the experience to be frightened. That spoke well of Merge VR goggles, as the headset fit tightly to my face and was pretty immersive. We played InMind VR on the Merge VR goggles, and found the game easy to control. The headset isn't really sized for portability. That said, it's fairly lightweight and made of a foam material, so the material feels soft and spongy against the face. That also means if the Merge VR gets thrown into a backpack, or tossed by a child, it's unlikely to get destroyed. Too often VR headsets are made of hard plastic shells that don't conform easily to the face. Merge felt comfortable, even when tightened firmly around my head. Points for that. And for younger users, the headset can be tightened considerably. These will easily fit children. Still, the design is far from streamlined: Merge will not fit in a pocket, and the device is not something easily packed. For those who want to bring the headset on a hike, and are porting a large backpack, the headset is probably perfect. Also, kids are going to likely appreciate the rainbow color options of the device: besides soda pop grape, there's fuchsia, green, red, banana yellow, orange, turquoise, orange, aqua, dark grey and silver. Getting a mobile device in and out of the goggles, however, proved difficult. The material gripped the mobile phone keeping in place, and that same hold also made removing a smartphone hard. I wear glasses, and also found that those weren't very comfortable with the googles on my face. However, the optics inside the headset were really good — far better than some of the thin plastic glasses on the market today. I did find after using the goggles that I was a bit queasy — not an uncommon after effect for some using VR headsets. But just an aside: I haven't had that experience with HTC Vive or Oculus Rift. 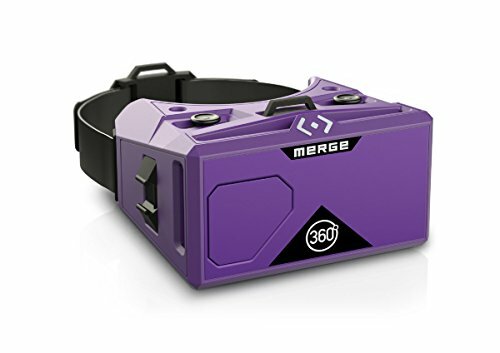 Pricing on Merge VR is pretty high as well — ringing up at $59.99 with a 30-day guarantee and a one-year warranty. Robust VR headsets are starting to come down in price, with Oculus Rift + Touch now just $399, and Playstation VR just $499. For those looking for a simple, introductory Google Cardboard VR device, Merge VR is certainly a decent option at $60. The headset is well-made, is likely to hold-up to wear and tear and can be used with any iOS and Android mobile device. And with the bright colors options — it's also going to be hard to lose.